Often, people only want to visit specific paid attractions in Rotorua. Then what? That's where Lost in Rotorua Self-Drive Tour Guides for friends comes in. It's a fun way to explore numerous free places - without having to work out the logistics, or pay for a personal tour guide to take you. Too easy. Next best thing, whether you and your friends are already here or in the planning stage, the guides are ready to go at a moment's notice. Next, next best thing. The locations are secret and for your eyes only. It's about having fun and surprising your friends. Mind you, you could just pretend you spent a huge amount of hours putting it all together and really impress the heck out of them. Lol. I don't mind. And, you're welcome. It all starts by leaving the watch behind and slipping into Rotorua time - yes, just like Fiji time - kicking back and letting someone else do the driving. Well, you get off the driving but you do have some work to do. You'll need to be free to direct your group with the hints, signs and markers to watch out for. 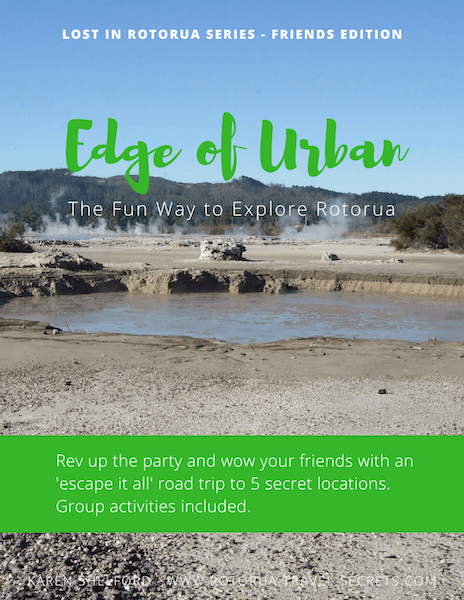 And if you're familiar with Rotorua and find you have been to some of the locations already, you can still play the game, especially if your friends haven't or they're overseas visitors. 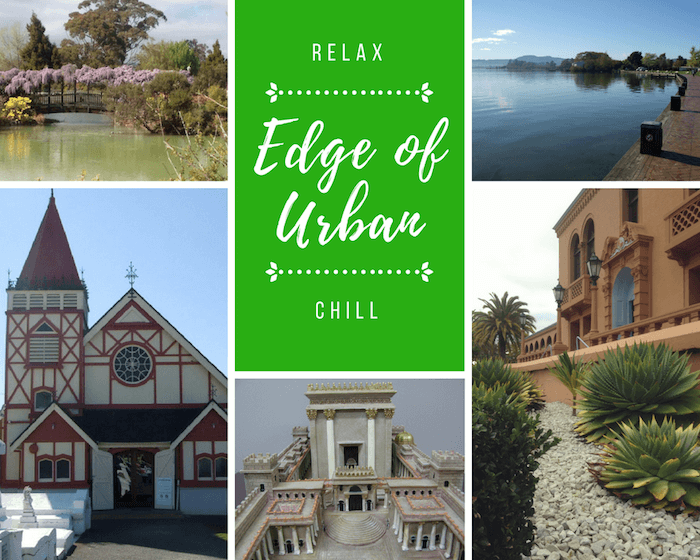 Edge of Urban Self-drive Tour Guide for Friends - As the name suggests, the locations in this guide are within a 1km radius of the inner city and the shortest in terms of travel time. For all that, it still packs a punch in terms of the places visited. In no particular order, you'll get up close to plenty of thermal activity (feel it on your skin too) at a number of the sites one of which is Kuirau Park. Visit the timeless Ohinemutu village where you will view the richly carved Tama-te-kapua meeting house and go to church at St Faith's (not a service, just to visit) where the interior is fascinating with a blend of cultures decorating the furniture, walls and ceiling and even the windows. Let your inner child come out to play dress-up and catapult back in time a few thousand years at Bibleworld. There is lots to see at Government Gardens but very relaxing just the same, and our busy lakefront offers not just a relaxing stroll but paid activities such as Kawarau Jet Boating for one (awesome by the way). 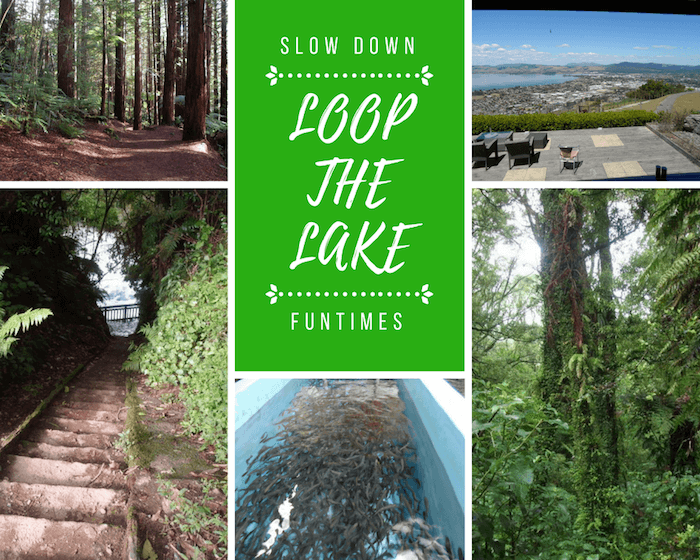 Loop the Lake Self-drive Tour Guide for Friends - This guide explores popular spots on a scenic drive around Lake Rotorua. You'll be craning your neck on the first walk amongst towering Redwood trees at The Redwoods. That's followed by a stroll along a bush-lined path to the world's highest commercially operated whitewater rafting falls at Okere Falls. You can then pop in and say hello to little ticklers at Eastern Game & Fish before getting up high to what I consider to be the wackiest place in Rotorua at Aorangi Peak, but the views, wow, the views are to die for (so a day where it's raining and cloudy is not the best time for this one). Finish off with a zone of zen nature walk on Mt Ngongotaha where you can forget everything and just Be (now that's a fine place to visit when it's raining - if you're dressed right). 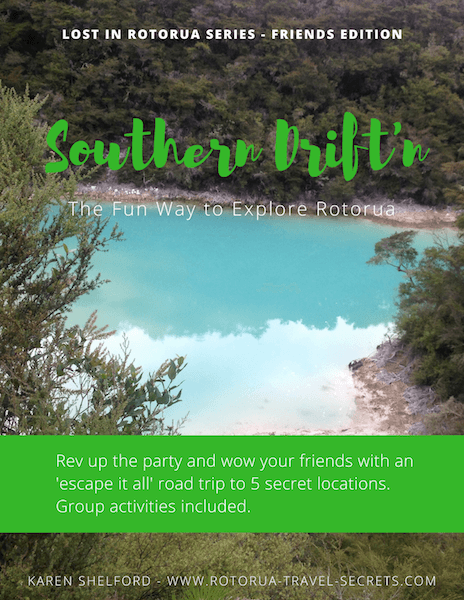 Southern Drift'n Self-drive Tour Guide for Friends - Head south of Rotorua to take part in your own mini-olympics before or after a short walk beside a picturesque stream at Waipa (next to Rotorua's exceptional mountain biking hub). 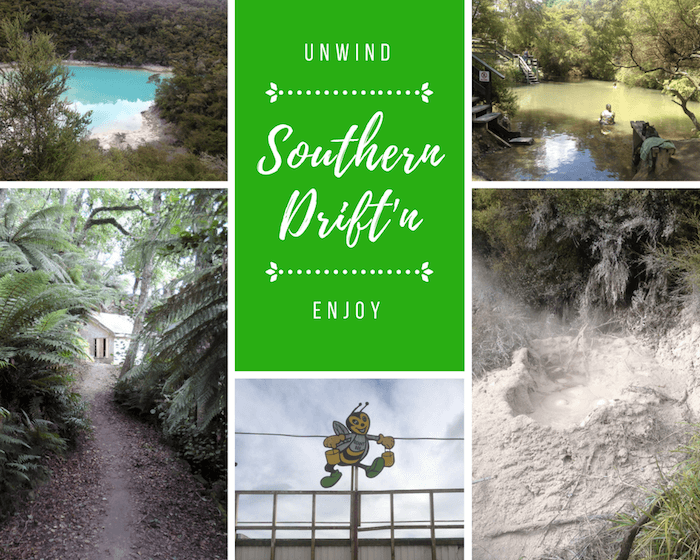 Travel further south to visit three thermal attractions - a short walk to see spectacular colours at Rainbow Mountain, a relaxing soak at Hot 'n' Cold streams, and see weird and wonderful muddy shapes at the Mud Pool. Finish off the day at Benny Bee's country store with a sweet twist or the Waiotapu Tavern. Approximations are itemised in the eBooks. 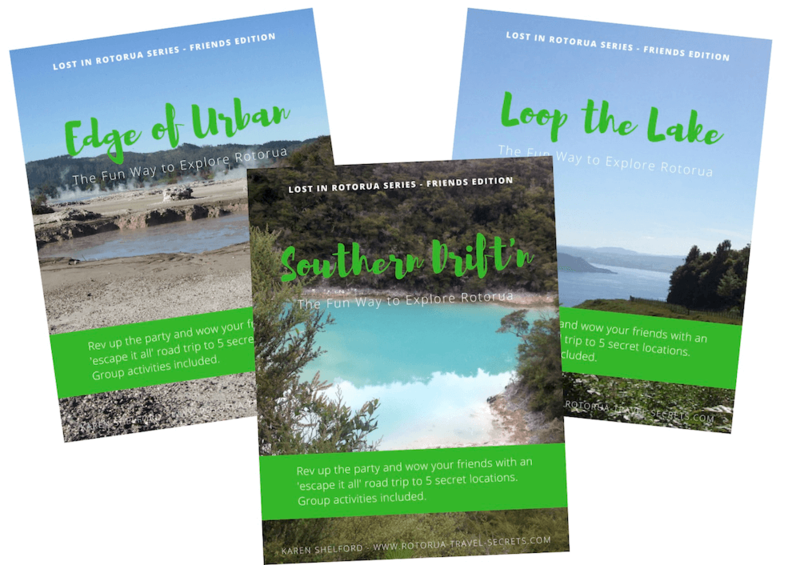 Purchase any edition of the Lost in Rotorua Romantics Series for just $4 OR, for even better value get all three for the price of two. That's only $8! There's no time like the present. Grab yourself a copy now. Best value? Get all three for the price of two! Gosh Darn It! Okay, I'll Buy All of You. Click! Clicking any of the Buy Now links will open a popup with the price of the product displayed. Add your first name, email address and click the button. On the secure screen that opens you can choose to use either Paypal or, if you look further down, a Debit or Credit Card. After payment expect to receive two emails. One is the order email outlining the product/s you have purchased and contains the download link. Right click to save to your PC or phone. Check your junk folder if you don't see this email within a few minutes. The second email will be your purchase receipt. Let me know if you have any questions about the guides before purchasing. Ordering problems? Don't worry, I'm only an email away. 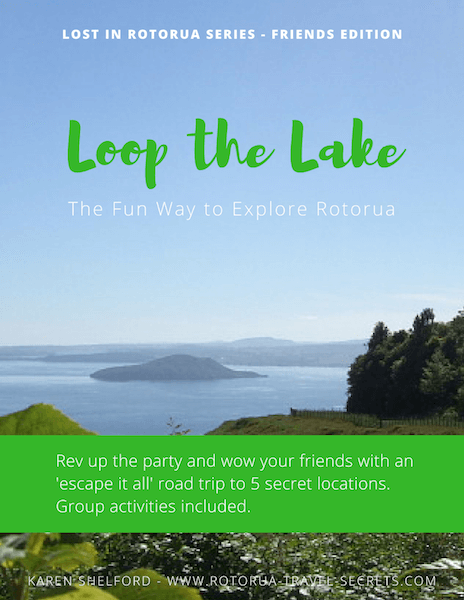 Got a brilliant idea for creating more value for visitors to Rotorua? I'd love to hear about that as well. There are not many photos in my eBook. Why not? Paper!!! People still like to print and have hard copies on hand so it saves on paper. Is there a way to do these tours without a vehicle? You could always walk the Edge of Urban tour. With the other two tours, it's a no, sorry. No buses travel these full routes either. Bottom line? You would have to hire someone to take you and that can be rather pricey.